It is almost impossible to see the daylight through the clouds of format wars between SACD and DVD-Audio. There are too many opinions to clearly find the solution - which format to choose in comparison with CD-DA and LP. Statistics are not favorable to the new high definition formats today. According to RIAA (Recording Industry Association of America) in 2003 only 0.4 million DVD-Audio disks were sold, 1.3 million - SACD, 1.5 million - LP, and 745.9 million - CD. CD sales reached the peak level in 2000 and are presently experiencing a steep decline. Perhaps the public interest in CD is lowering down because of the phenomenal steady growth of the DVD-Video format - 369.6 million including music DVD in 2003. Even now funny incidents sometimes happen: in 2004 in a Circuit City store the sales representative with a serious expression asks clients if they have a special player to play back the purchased SACD disc (note that there is a label "Hybrid" on the disk cover, which shows that the disc also contains a standard recording in the CD-DA format). It's clear that high definition formats have more capacity to support high quality signals. The question is how great this capacity is and where can we get this superb quality signal from. Is it always present on discs with attractive SACD or DVD-A labels? A lot of argument about the quality of formats lies in this plane. Some SACD were developed in ProTools, the most widespread development package using the PCM format. To process a DSD steam on the mastering stage they had to convert it into PCM, make necessary changes and then convert it back into DSD. Even if the record quality does not suffer much from a proper DSD to PCM conversion, then at least all advertised theoretical advantages of Direct Stream Digital (that is the direct route of the signal from a studio microphone to the speakers of a listener) is obviously put into prejudice. Besides, the ProTools package in those years was mostly based on hardware processing with algorithms designed in their quality for the output CD-DA format. But if a 16bit 44100 kHz PCM source was used as a master track, the sound quality of the resulting SACD disc could be worse than that of the similar CD record. The first DVD-A disks couldn't demonstrate superiority of quality either. Despite the fact that most of them were created in 24bit 48 kHz, some of them were in 20bit 48 kHz. But the format evolved, there first appeared 24bit 96 kHz stereo tracks on DVD-A, and then multi-channel 24bit 96 kHz tracks. Modern DVD-A Advanced Resolution has a multi-channel track of 24bit 96 kHz and/or stereo 24bit 192 kHz/96 kHz. Moreover, they are usually created from 24bit 96 kHz / 192 kHz master records, all the processing being performed on state-of-the-art equipment with high definition (supporting 64bit 384 kHz), which considerably influenced the resulting quality. So Which Format is of Higher Quality? CD-DA format (PCM 16bit 44100Hz stereo) became obsolete long time ago, its limitations do not allow to reach the level, required by today's music lovers. We cannot obviously ignore the incredibly large CD-DA market, which cannot be even approached by SACD and DVD-A. But just few years ago the same thing would apply to the market of video cassettes and DVD-Video discs. Popularity of the CD-DA format and it's ease of use do not allow to predict that this format would end like VHS, but nevertheless, its substantial limitations such as frequent clipping (signal limiting) because of the wish of an audio engineer to achieve a maximum dynamic range, the spectrum limitations (they are discussed in this article below), and new interfaces supporting high definition formats in unfailing digital form to transfer among devices (i-link, HDMI, Denon-link, M-link, etc) make us presume that in the nearest future CD-DA will shift to the mass area, as for example, the mp3 domain, making room in the music lovers' sphere for the formats DVD-A, SACD and WMA9 pro, supporting 24 bit 96kHz multi-channel Audio, promoted by Microsoft. The comparison of multi-channel audio and stereo, their pros and cons is an other story. 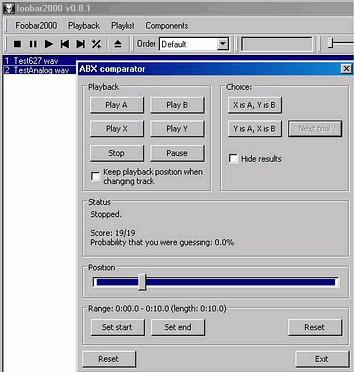 In case of correct CD playback (as it is implemented in devices from some High-End manufacturers) and incorrect playback of SACD and/or DVD-A, the former may have higher quality sound, defined in double blind tests (ABX eliminates the placebo effect, or the autosuggestion influence of the listener on the final results), which in its turn served as a battleground for disputes about the quality of high definition formats. Double blind tests are not ideal, though they allow to reach rather acceptable conditions to get statistically correct results. It's strongly recommended to use the free program PC ABX or the free ABX plugin to the well-known program Foobar 2000 to make sure whether we really hear the difference (not just persuaded ourselves that this difference exists) and only then look for the reason. Try to record a couple of fragments from CD (it's better to rip the tracks) and record it from the identical DVD-A. Then, using ABX, with high level of probability you will find out the difference (see the details). 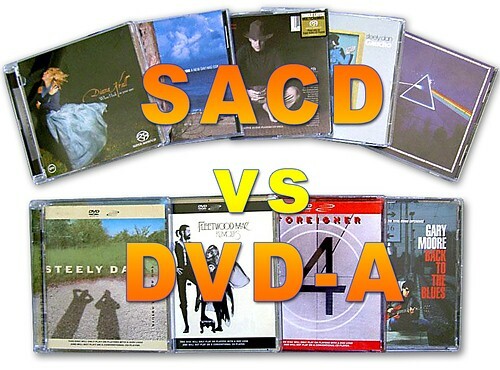 The interesting comparison on the quality of DSD SACD and PCM DVD-A had been provided by Craig Anderson. Though he came to the conclusion about the advantage of PCM 24/192 in the accuracy of signal representation, the oscilloscope plot of the 10 kHz square wave demonstrates some kind of identity for results in PCM 24/192 and DSD. Smeared forms of the DSD signal can be explained by ultrasonic noises, the picture was smoothed in time due to pixel latency in the oscillograph screen. You should take into account that the DSD format is significantly more difficult to process regarding bass management and time alignment control for sound equalization at the listener's point as well as for acoustic system calibration (acoustics-room). Everybody has been waiting for a DSP to make adjustments in the native form of DSD streams in consumer equipment, SONY announced several new chips (CXD9776Q and CXD9722Q) using the DSD processing algorithms in the brochure ES Series Receivers Technical Background regarding STR-DA9000ES, but ... as a result according to the service manual all these adjustments are processed in PCM domain (in the 9000 model). As we known, this top model does not have the acoustic room reaction calibration feature, though it could have it considering processing in PCM and the availability of similar functions in the closest competitors from Pioneer, Yamaha and Denon (similar calibration is implemented in the 3805 model and we already know the new top model 5805 with the same feature). Thus, for the time being the DSD format from the point of view of the availability of necessary modern solutions is less interesting to audio equipment manufacturers, and even Sony is not ready to offer full complex of DSD signal processing in its original form on the consumer electronics level. LP as a quality data media was knowingly discredited at the CD-DA introduction stage, marketing experts of the companies, interested in CD-DA promotion, carried out mass brain washing. Even today in case of correct playback the LP format is not just ready to compete with CD-DA in audio quality - according to many audiophile's opinions this format often outscores CD-DA. What's the reason? Some measurements carried out by enthusiast-audiophiles and professionals, give us the ground to presume that the reason is in a wider spectrum and, despite the prevailing opinion about the 60dB limitation, still sufficient dynamic range. 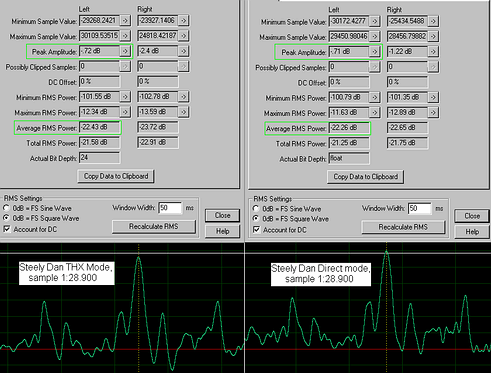 Have a look at the LP dynamic range measurements taken by Chris Johnson. You can also see the LP spectrum limitation measurements taken by an Australian audiophile and the author of the reviews on the equipment Chris (Christine) Tham. 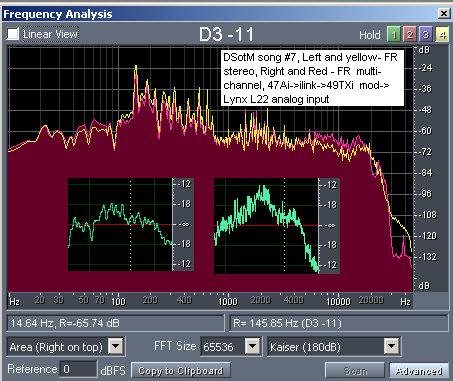 As you can see, LP dynamic range is close to that of CD-DA, and its frequency band considerably surpasses the latter. It's recommended to read the complete article Spectral and Dynamics Comparisons of LPs vs digital formats. Another important moment - we can't forget that at the time of CD-DA format launching, the LP recording's analog originals were mostly processed on analog equipment, which practically reached it's peak of development. Digital equipment for CD-DA was not perfect - low DSP resolution for processing (often only 24bit for 16bit CD-DA signal, which resulted in rounding off for the resulting 32bit figures at multiplication operations, and thus, in digital artifacts in the output signal), low sampling frequencies, lack of dithering and noise-shaping, which were added to the CD-DA toolbox later, high level of jitter in digital audio recorders. Some audiophile studios even decided to roll back to analog mastering systems. All such problems remained recorded on CD, that's why their quality differs so much from specimen to specimen despite the fact that "digit is always digit". However as we known, the same or similar drawbacks are typical of early DVD-A and SACD. Why do We Need Frequencies over 20 kHz? We have come to an important stage. One and the same question has been asked on different forums in threads about formats and their quality - if a human being can't hear frequencies over 20 kHz (in rare instances 21 kHz) then the 22 kHz limitation in CD-DA (according to the Nyquist theorem it's a half of sampling frequency, for 44100 it will be 22050Hz) should pose no problems, shouldn't it? Why do we need 50 kHz, 70 kHz, and even 96 kHz, if we don't hear them anyway? And the second point - if our speakers have the stated pass band of 20Hz-20 kHz on the level of -3dB, then why do we need DVD-A or SACD? Our loudspeakers will not be able to reproduce the required spectrum, and moreover, intermodulation products of ultrasonic frequencies may get into the audible region and distort the original signal. Isn't it better don't have these ultrasonic images? "Although human hearing is generally very poor above 20,000 Hertz, ultrasonic frequency roll-offs produce phase and amplitude effects in the audible region; for example, a single pole (6dB/octave) roll-off at 30 kHz produces about 9 phase lag and 0.5 dB loss at 10 kHz. The effects may be subtle, but their audibility is undesirable in a piece of equipment whose performance is judged by its neutrality." (original). Thus, being aware of our hearing sensitivity to phase distortions, we can presume considerable decrease in the level of such distortions in the systems with a wider signal spectrum (including the quality LP playback). The second point - if we limit the original signal with the analog anti-aliasing filter for the CD signal spectrum in comparison with the same filter for DVD-A 24bit 96 kHz signal when trying to record the spectrum of such instruments as a trumpet, there will be a considerable difference in phase distortions between the original and the record even before it is delivered to the speakers. The speakers (well-designed) have mildly sloping signal falloff characteristic at high frequencies, which mostly depends on the tweeter design, and thus introduces fewer phase distortions than the filter with a steep amplitude-frequency response falloff, which is in fact the CD-DA format for the wideband spectrum signals. And what does the science say about the sound difference in DVD-A and SACD in comparison with CD-DA and the reasons for such differences or their lack? Let's take a look at Dr. David Griesinger's presentation. Together with Jim Fosgate he is one of most known scientists in the multi-channel surround sound theory, the man who created and developed Logic7 (Lexicon's proprietary surround sound processing algorithm). This respected professor conducted serious research and found out that very often DVD-A and SACD discs do not contain the advertised ultrasonics. He surmised that we hear the difference due to intermodulation products in high frequency speakers that get into the audible region. 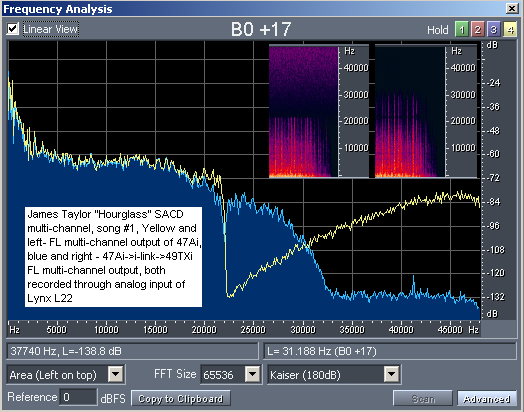 Professor refers to the work "Karou and Shogo "Detection of Threshold for tones above 22 kHz". Yes, we cannot really hear ultrasonic images over 20 kHz. But the above mentioned work was carried out for the signals with even order harmonics and the audible odd order harmonics produced due to the transmission nonlinearity in the device. Having eliminated the nonlinearity and thus the odd order harmonics (in fact the odd order harmonics only testified to the appearance of intermodulation products due to this nonlinearity in the audible region) the ultrasonics became inaudible (that is there disappeared not only the odd order harmonics and the intermodulation products as well). That's the way it should be, because we cannot hear ultrasonic signals of the sine form. In the presentation Dr. Griesinger provides the information concerning some difficulties in finding of the acceptable soundcard for the experiments. If we will tale a look at the noise ground level in the used soundcard, it looks like it is still not acceptable. With a better soundcard the results could be different. Signals of -3dB and 20 kHz and 25 kHz transferred to the speakers. 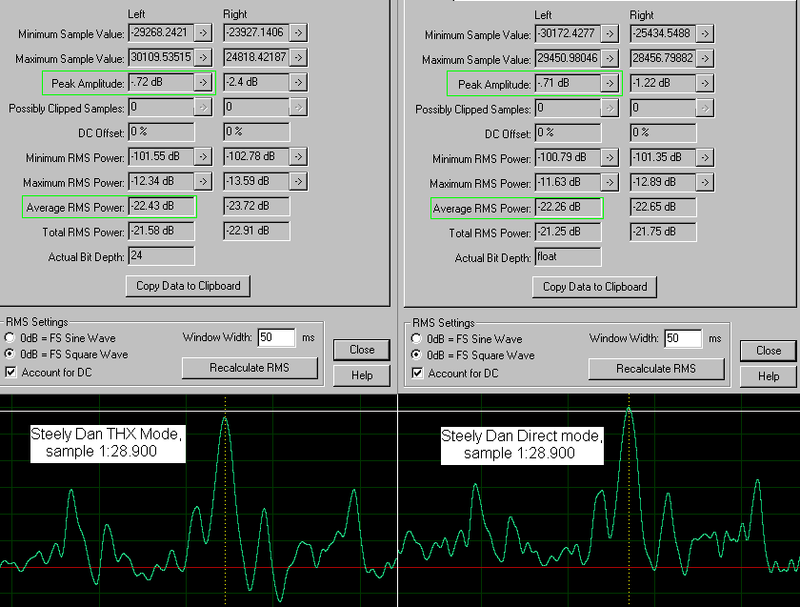 We should expect intermodulation and clipping (in majority of cases) on these levels and frequencies in consumer-grade devices, we need to use professional devices to avoid them (able to pass CCIF measurements at such levels, for example my old Audigy produces clipping an the -6dB level using 19kHz and 20kHz). Please pay attention to the noise floor that you can see on the spectrograms in the high frequency region. With the used combo (player + sound card) it reaches -90dB. Thus: the audible products of intermodulation distortions are due to the amplifier (not because of the speakers). Then several specimens of SACD and DVD-A had been examinated, measurements demonstrated that these discs DO NOT contain ultrasonics over 23 kHz. 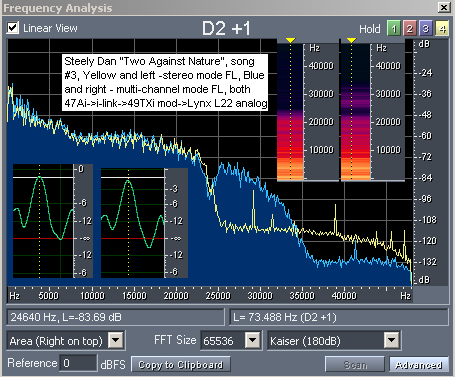 Interestingly, the noise groundfloor at the graph in DVD-A Steely Dan reaches -72 dB (strange kind of DVD-A - it's noises exceed the CD-DA limitation by several dozens dB), and the SACD noise groundfloor is a bit better, but it still reaches -78 dB! But we DO really HEAR the excellent sound quality of the records on these discs. It was decided to use the available specimens Steely Dan "Two Against Nature" DVD-A and SACD multi-channel Diana Krall for the re-test. 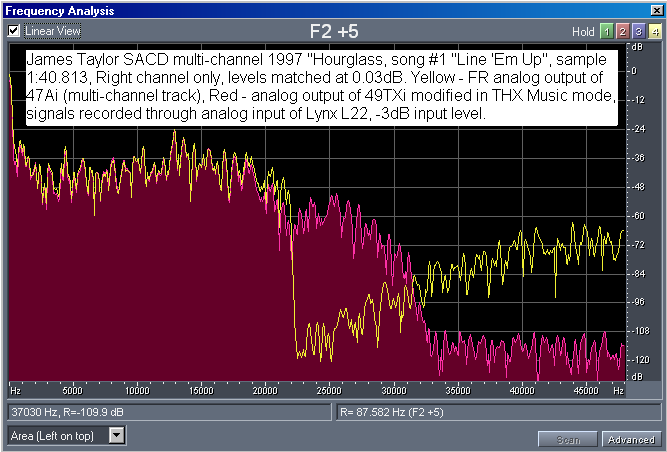 The author of this article carried out quality measurements using a top-level professional sound card Lynx L22 (dual channel version of the sound card Lynx Two), which is probably the best tool for similar measurements (the "measurement" function is noted in the card's specification) at the level below professional measuring equipment such as AP. The obtained results were somehow different then the previous ones. On the spectrogram we can see that the lower noise border is at -132 dB for the multi-channel track. The suggestion concerning the significant difference in the results in not only in the the sound card quality. The possible reason is that the device (DVD/SACD-player) filtered the output signal and that multi-channel and stereo tracks contained different signals, we will provide some information below to support such kind of statement. Measurements were taken as accurately as possible - samples are matched on the corresponding signal peaks and levels (one of the signals is amplified in Adobe Audition 1.5 with resolution of processing at 32bit floating point 96 kHz) and only then followed the comparison. As it's difficult to assume that the THX-processing adds some nonexistent ultrasonic signals to real multi-channel tracks, it looks as to all appearances they really exist on the tested SACD and DVD-A discs. Though not all devices could reproduce them. And here we come to the important point - the problem is not with formats, the problem is with their correct playback! This point is supported by the measurements. We are very thankful to Dr. David Gresinger for his presentation, which supplied an idea to create this article. There is a significant amount of useful information concerning multi-channel surround sound at his website. High frequency and level noises create intermodulation interference in the audible region, plus phase distortions due to sharp spectrum edge at 22 kHz allow to guess the difference 19/19 in double blind tests, that is with 0% chances of guessing. Note that the signals were aligned by their levels and were practically identical by sight at the frequencies up to 18 kHz (the picture above contains the same sample). Thus, we can nevertheless hear ultrasonics (not separated from the original audible signal), and the noise level, which is considered inaudible for SACD-signals, plays its role, because these high level noises create intermodulation products in the audible region (of the same random order as the noises) can influence the sound transparency and the perception of low level reflection signals. What is the Correct Way for SACD Playback? How can we play back SACD correctly? We can agree to well-known Russian engineer Dmitry Andronnikov, who expressed the idea to convert the DSD-signal to PCM and then reproduce this signal via multibit DAC. This approach is implemented in the AX10 (49TX) receiver and then used in all top receivers from Pioneer. What's the reason, why do we get better quality with seemingly extra "additional conversions"? The point is in reduced distortions (it sounds as a non-sense, but please don't make fast conclusions) due to these additional conversions. In fact the point is in DSD->PCM converters (for this purpose they usually use SM5816 or in the new devices - SM5819A), which in fact are high quality digital filters operating at the frequencies 2Fs and 4Fs in the aforesaid devices, which filter all high frequency noises in SACD at the level of -130dB not allowing these noises to create intermodulation products in the audible region and to "overload" the operational amplifier with HF components in I/V after DAC. 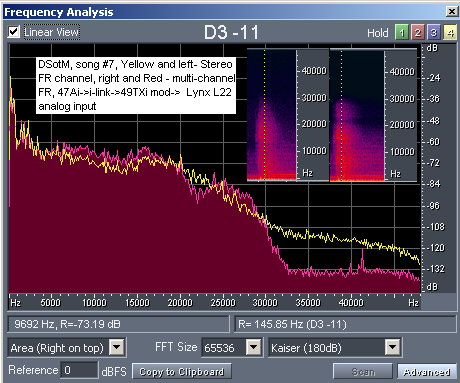 Using a digital filter before DAC, operating in the oversampling mode, we cut-off the remains of HF interferences from the DSD steam achieving for the SACD signals the same quality as for DVD-A of the high definition. Top Pioneers use multibit (Sign-Magnitude) PCM1704 as DAC, the top receiver Yamaha Z9 contains a new multibit delta-sigma DAC PCM1792, which allows to compare playback modes via DSD->PCM conversion (the same SM5819A is used for such purpose) or via analog filters (implemented in PCM1792) as it was done for PCM1738. However, after all our measurements the result is predictable. Dmitry's hypothesis is supported by the fact that in the new digital top receiver Sony STR-DA9000ES the entire signal processing is done in the PCM format, the DSD circuits after the DSD->PCM conversion are not used, and the corresponding chip pins are grounded (DSD to PCM conversion is up to SM5819A, which is re-bandged by Sony as CXD9742). Pay attention to the difference in noise levels and spectra when playing back multi-channel tracks and stereo tracks from the same discs . You can see that the common stereo tracks are created from stereo sources, often with a pass band limitation at 22 kHz or 24kHz and a considerably higher noise level. 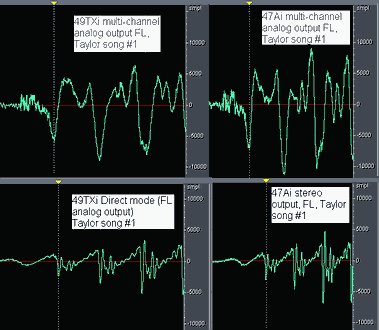 Multi-channel tracks, which are usually completely remastered or recorded anew from the 24bit 96 kHz original master sources, feature quite a different signal quality. In one's time many people discovered an essential difference in quality when playing back SACD multi-channel Dark Side of The Moon using multi-channel and stereo tracks (SACD in both cases), but after our measurements we already know the reason. Thus, multi-channel systems and the THX sets of the speakers are much more interesting than it used to be considered, but that's another story. Comparative audition of a wide range of DVD-A and SACD records on the equipment of the sufficiently high level* does not allow to give preference to one of the formats, the difference depends considerably on the mastering quality, and actually does not really depend on the format as such. Taking into account the above analysis and the theoretical DVD-A dynamic range reserve, we can assume that the DVD-A format has not yet fully realized its potential in the modern equipment, while SACD is close to its maximum capacity. But nevertheless, at present this capacity allows the sound quality quite sufficient (with a correct approach) to satisfy the audiophiles' requirements. * DVD-A and SACD signal transmission via i-Link at full resolution, the further jitter suppression using PQLS (AV/C Command Set for Rate Control of Isochronous Data Flow 1.0 protocol) and then (DSD signal is converted into PCM in SM5816 converters) via High-End DF1706 digital filters in the oversampling mode x8 (or x4 for the 192 kHz signal) to the multibit PCM1704 DAC using the high quality operational amplifiers OPA627 in the current-voltage converter and then via the Pioneer AX10i (49TXi) power amplifier to the speakers M&K 150THX with subwoofer M&K MX-350MkII. We have already drawn the conclusions, it remains to say a few words about the new mastering systems allowing much higher quality both in SACD (DSD) and in DVD-A. After the SADiE system was launched, based on the E-chip idea, the entire DSD stream mastering is possible without the PCM conversion, and thus the problem of quality loss in discs disappears. We have scant information about this chip, but nevertheless its main principles are clear. DiskWelder Chrome is usually used for DVD-A authoring, which supports the maximum resolution of 24bit 192 kHz and MLP-compression if a necessary program is used (for now we know about Surcode MLP), initial music files can be prepared in any professional multi-channel sound editor, such as Pro Tools, Steinberg Nuendo, and others. With the launch of relatively affordable DiskWelder Bronze and Steinberg Wavelab 5.0, the DVD-A format is getting available to a larger audience, and considering the new designs in DSD (Sonic Studio DSD1.1), operating for now only on the Macintosh platform, SACD will soon become a more or less affordable format as well.